An energy shackle is a piece of Covenant technology used to physically restrain an individual. 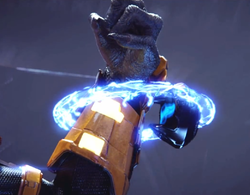 When activated, the energy shackle emits a blue ring of energy around one of the limbs of an individual, and levitates in a fixed position, making it extremely difficult to move. The shackle also has the ability to electrocute the restrained individual. In October 2552, a pair of energy shackles were used to restrain Thel 'Vadamee while he was branded with the Mark of Shame. Sali 'Nyon was bound by a set of energy shackles when he was captured by Jul 'Mdama's forces in July 2558. The shackles in Halo 2. Sali 'Nyon restrained by the same apparatus. ↑ 1.0 1.1 1.2 Halo 2, campaign level, "The Heretic"